The 1st game for 2019 will be a memorable one for many good reasons. Both teams came together to pay tribute to former Australian, NSW and St George legend Bill Watson with a minutes silence. Watson passed away two weeks ago aged 87. Wests won the toss and threw the Saints in to bat first. The loss of Stapleton saw NSW star Kurtis Patterson come together with Luke Bartier at 1-10 and put simply, they made the day their own with a record breaking 309 run partnership. Ironically the record they broke was the 2nd wicket stand which was for 264 runs and had stood for over 50 years. It was set by Norm O'Neill and guess who .... Bill Watson. It was as if the great man was smiling down on these two young Saints. Bartier was eventually dismissed for 133 which came off 133 balls with 8 x 4's and 5 x 6's. Patterson remained not out with 167 which could be the highest limited overs century for the club (pending check). He batted for 147 balls and hit 17 x 4's and 4 x 6's. It was a masterful display of aggression and sensibility with his turning over of the strike as impressive as his attacking play. It is his 10th century for St George in 1st Grade and his 2nd highest with the 177 he scored in 2011-12 his best. The Saints finished with 5-349. With NSW legend Trent Copeland also back in the fold it was always going to be a tough chase. Wests, who were a player down after a fielding mishap were dismissed in the 48th over for 194 with Tom Ortiz continuing his great form with 3-34 and two wickets being shared by skipper Copeland, Bartier and leg spinner Englebrecht. It was a pretty good day throughout the grades but unfortunately our 2nd Grade boys missed out. 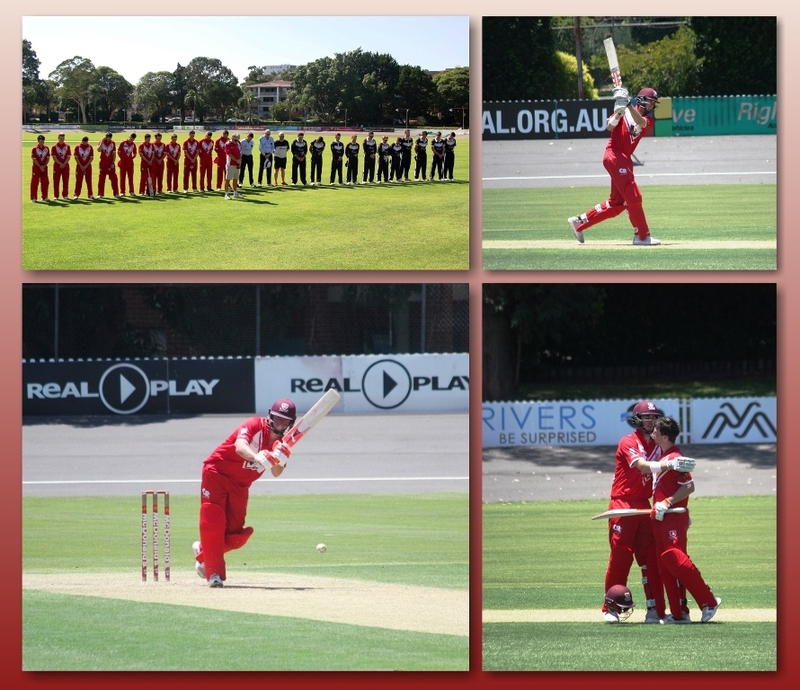 They did well to contain Wests to 7-205 with the wickets being shared around. Unfortunately they fell 28 runs short. Adam Whatley led the way with 66. Thirds had a solid 7 wicket victory after they restricted Wests to 9-163 with Nick Shurmer claiming 3-31. Their chase got off to a flyer with a 116 run opening stand of 116 between Jackson Shaw (64) and Billy Konstas who finished with 75 not out. Fourth Grade looked like they were going to do it easy when they dismissed Wests for 80 in the 41st over. Vasi MacMillan led the way with 3-26 whilst super veteran Rod Krause (8 overs) and mega veteran Steve Wark (9.4 overs) both claimed 3 for 13. The lads claimed the win before 30 overs but not before they worryingly lost 8 wickets. Sadly there was a disappointing issue with the Covers in 5th grade which meant there was no play for 5th Grade. Sunday sees our Green Shield (U16) and PG (U21) teams both play Campbelltown at Raby.